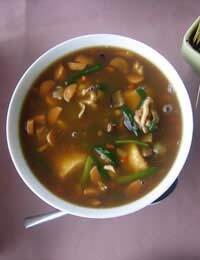 Unlike many of the soups you may be familiar with Thai soups tend to be clear and spicy. Many of them use fish sauce, which you should be able to get at an Asian supermarket or specialist grocery store. If you can't, you could try a mixture of anchovy paste and soy sauce in its place. Place the coconut milk, stock, ginger, lemongrass and lime zest in a saucepan. Bring to the boil and simmer for 5 minutes. Add the chunks of chicken, chillies, fish sauce and sugar. Return to the boil and simmer for another 8-10 minutes or until the chicken is cooked. Serve immediately garnished with some chopped coriander leaves and a squeeze of lime. It's a good idea to avoid the lemongrass stalks when dishing up. Soak the mushrooms in the water for at least 20 minutes before using. Cube the pork and chicken and put in a saucepan with the stock. Bring to the boil. Add the thinly sliced mushrooms along with any remaining water, onion, garlic and fish sauce, and simmer gently for about 20 minutes or until the meat is just cooked. Add the noodles, prawns and cucumber and continue to simmer until the prawns are cooked - they'll no longer be translucent. Gradually stir in the beaten eggs allowing it to cook as fine strands. Serve immediately with a garnish of chopped coriander. Place the water, lemongrass, ginger, lime leaves, tamarind paste, fish sauce and prawns in a saucepan and bring to the boil. Simmer for about 3 minutes. Add the onion, chili paste and straw mushrooms. Return to the boil and simmer for another 6-8 minutes or until the prawns are cooked. Add the chilies and chopped tomato. Remove from the heat and add the lime juice. Season to taste with extra fish sauce if desired, and serve garnished with chopped coriander. Thai chili peppers are small, red and very hot! You may want to reduce the number to taste. Fish sauce, roasted chili paste and straw mushrooms can be found in Asian supermarkets. Now this one's not really authentic Thai but a yummy soup nevertheless. Cut the squash into large chunks. Pour the oil into a baking dish and toss the squash in it until well-coated. Bake for about 1 hour or until the squash is tender. Allow to cool until you're able to handle it. Scoop all the flesh into a pan and add the coconut milk and curry paste. Stir well and bring to a boil. Remove from the heat and blend in a liquidiser and then return to the pan. Gradually add enough stock to give you soup of a good consistency. Bring to the boil and season to taste. Serve garnished with chopped coriander.